The Dream Shirt: Printing your favorite books, one shirt at a time - Hits and Mrs. Wear your favorite book – this is what The Dream Shirt persuades bookworms to do. But who or what is The Dream Shirt? The Dream Shirt is an online store that offers made-to-order shirts with prints that feature quotes and designs based on different books. Designs are printed on cotton shirts in vinyl or via heat transfer. Most of their selections are based from Young Adult novels like John Green’s “Looking for Alaska” and “The Fault in Our Stars”, or popular dystopian novels such as the famous “Hunger Games” trilogy and “Divergent”. Although their current fan base consists of young people and YA fanatics, The Dream Shirt plans to target a larger market, tapping in the bookworm crowd in general, by providing designs that are based on the classics, fiction novels, and the like. 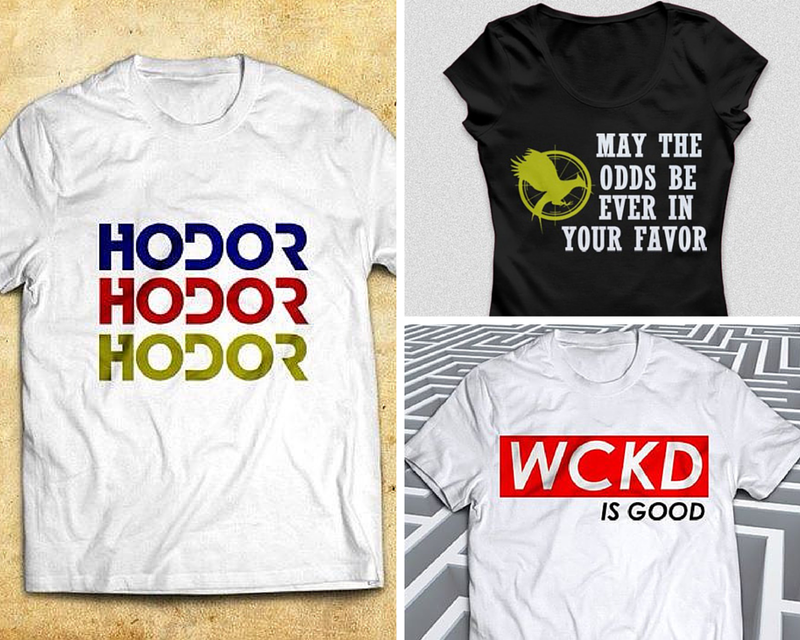 Samples of their shirts based on books like Game of Thrones, Hunger Games, and The Maze Runner. A shirt costs around PHP 350, exclusive of shipping fee. Unlike most of its competitors, The Dream Shirt aims to stick to creating book-based shirts, and expand its designs by having its own artistic team that will put their ideas into reality. The company also aims to be more present offline by participating in bazaars and other book-related activities. A website is also in the works, to provide its customers a better shopping experience. For now, the online store of The Dream Shirt is on Facebook. And from the idea to create shirts for bookworms, it has truly grown, with more than 2.5K FB Likes just after a year of operation. With more and more fanboys and fangirls finding out about The Dream Shirt, the store is planning to have its relaunch by 2015, and will include creating a line for locally published books, releasing more collections, and collaborating with Fandom Trinkets PH for a giveaway. Check out The Dream Shirt on Facebook, Twitter, and Instagram. For collaborations and partnerships, contact them at thedreamshirt@gmail.com or at 0906-3811776.